Also known as a “waterbug,” or a “Palmetto bug,” the American cockroach is not native to America. Experts believe it was introduced via ships from Africa in the early 1600s. American cockroaches are found most often in large commercial buildings, such as restaurants, bakeries, grocery stores, food processing plants, hospitals, etc. They infest food storage and food preparation areas, basements and steam tunnels. They can be found outside in summer months. Most commonly, they are introduced into buildings through the sewer system via drains, by being brought in, or by mass migration from other structures, dumps, etc., during warm weather. 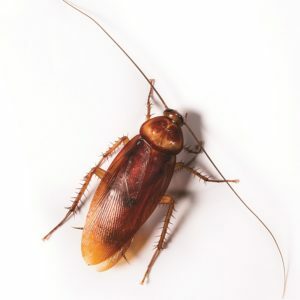 American cockroaches can be a health hazard as they are carriers of human disease pathogens, especially with their frequent association with sewage, decaying organic matter and dirty conditions. They transfer the germs and bacteria they come in contact with onto food and food surfaces. Reddish brown with a pale brown to yellowish band. 1 3/8-2 1/8 inches (34-53 millimeter) long. Adults are 1 3/8-2 1/8 inches (34-53 millimeter) long; reddish brown with a pale brown to yellowish band around edge of pronotal shield. The American cockroach consumes decaying organic matter, but will eat almost anything, including small insects. When inside a facility, they are attracted to crumbs, food that’s been left out or spilled, and pet food. When outdoors, American cockroaches will eat leaves, wood particles and algae. Females drop or glue their ootheca (egg capsule) into a crack or crevice with high relative humidity near a food source. The bean-shaped ootheca, which can contain 14-16 eggs, is reddish to blackish brown about 3/8 of an inch or 8 millimeters long. The time it takes from egg to adult can vary from half a year to two years depending on room temperature, but in ideal conditions it takes about 20 months. During this developmental time they can molt 10-13 times. Control within a building can be difficult if the city sewer system is infested.